Although Bernice Liu (廖碧兒) and Moses Chan (陳豪) broke up in 2008, their names continue to be linked together. Bernice’s opportunities in Mainland China and winery business are both flourishing, but at the expense of her love life. Left with little time to date, Bernice remains single while ex-boyfriends Hawick Lau (劉愷威) and Moses Chan have both married and become fathers. Moses’ son, Aiden Joshua, is only nine months old, but his second baby is on the way. Married to Aimee Chan (陳茵媺) in Paris last June, Moses’ family picture already seems complete. With Aimee currently three months pregnant, Moses will be busy raising little children for the next few years. Appearing at a skincare event today, Bernice was teased by the press that she needs to put in more effort as Moses will soon become a father again. “Oh, I’ll try harder in my work,” Bernice said, but dodged any response over Moses’ news. The 35-year-old remains single although she has been linked to French sommelier Jean-Charles Cazes and Fala Chen‘s (陳法拉) ex-flame, Daniel Sit (薛世恒). She looks forward to meeting the right person, but her frequent travels prevents her from developing a relationship further. Aside from time in Mainland China, Bernice often flies to France to oversee her boutique winery, Bellavizio, which has been producing wine since 2008. I pity her as the media still continues to link her with Moses. You can’t rush love, at the outer Moses seems to be happily married to Aimee. But you’ll never know if she would be happy or she wouldn’t be happy if today she is married to Moses. China is China, what mainland China, with a capital M??? Ridiculous. Is there any other country named China other than China??? .. because people in HongKong and Macao still considered their territory to be distinctly independent. Hence “Mainland” to foster that distinction. Actually people in Hawaii refer to the continental US as the “mainland”. And people in Alaska refer to the main part of the US as the “lower 48 states”. So not that different here. So even though Hong Kong, Macau, and Taiwan aren’t that separate geographically from mainland China, culturally they are very different. I would say that the people who live in Hawaii feel the same about the continental US. It is outsiders who like to lump everyone together. Hawaii is not geographically connected to the US Mainland, so for Hawaiians to refer to the US Mainland as Mainland is rightfully so. On the other hand, Hong Kong is physically connected to China, so from a geography perspective, that doesn’t make any sense at all. For them to refer to China as Mainland. This is a pretty picture of Bernice Liu. She comes to be too ‘big sized’ and westernized in her character, but this picture is different. Maybe due to maturity, and success as a business woman. Oh yes, she looks pretty and sophisticated in the picture above. They should just leave her alone. And stop asking her about her ex. Wow berlinda’s already 35? She doesnt look it! Kudos to her for keeping her youth so well. Must be all the wine :). As to her fertility, well she’s Westernized and i dont feel she has really adapted to Eastern culture, even though she continues to work and thrive here. Kinda how i feel about Daniel Wu. I think she’ll also marry a Westerner someday. Meant to say as to her perception on age and marriage, she holds a westerner’s view – aint in no rush. Bernice looks pretty in the above picture. Honestly speaking, she looks more compatible with Moses rather than Aimee! There apparently is NO sensitivty or ethics left in the media world. What has this got to do with her anymore? And then twist whatever she replies out of context so Moses + Aimee fans and supporters can go rabid on her? Let the girl move on with her life. i still remember watching moses and bernice in healing hands and love bond. i thought they would be married to each other. Her plastic surgeon did a good job on her square jaws. She looks so much prettier than before. Prolly botox. She used to look like a footballer to me with her strong square jaw and broad shoulders. She wasnt ugly, just somewhat masculine in stature and features. Bernice looks way better than before! and i think her plastic surgery done a very good job! OMG! second child! good luck to Aimee Chan!!!!!! I am already looking to her 3rd child maybe in beginning of 2016. Now we know why celebrities do not like to tell who they are dating. The media would still drag it out even after decades I think 🙁 ! O gosh………the media should really leave artist alone about there personal life they got nothing beta to do then to make up stories and sheeeit……….. I am happy to hear that Bernice has a great career. I hope the media will stop hounding her with Moses-related questions. They broke up many years ago and it’s time for the media to move on with newer news instead of digging up the past. Really annoyed at how the reporters are comparing Moses’ life to Bernice by asking her if she feels the need to find someone now that Moses’ is at his second baby. Everyone’s life moves at a different pace, people have different goals, interests, and passions to follow. Only because she is his ex, they are asking her these questions. Feel bad for Bernice. In time, she will find someone who is right for her. At a glance of an eye, she is 35 already (time flies since she entered the industry at the turn of the century) but still looks amazing. I doubt she will have trouble finding someone who loves her given she has beautiful looks and body that goes well along with her good nature/personality. 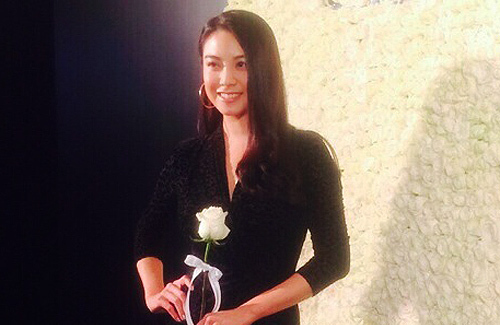 Bernice occasionally films dramas in China. She also attends a lot of events, so that’s probably her source of income. I believe she also owns a wine place. Yeah, some artists are popular amongst sponsors. Bernice was the top earning artist bc of that. Same with Eliza, not top earning though. So, filming TVB dramas give you exposure. What do you expect her to say? I am jealous? Moses aint a waste but Hawick Lau can be a cute one. He got lucky that one when he was a nobody in TVB. oh well….35 is not that old yet so … better luck next time. Screw the Chinese media, the way the article was written, the angle the writer tried to portray Bernice, made it sound like it’s bad that she’s still single at her age. There’s nothing wrong with being single. Marriage does not equal happiness. I know just as many unhappy marriage couples as those that are single, and at the same time, I know many singles that are happy, just like some marriage couples. Even unhappier are those who are married, ‘imprisoned’ (family obligations) and lonely … but always pretending to be happy to the world (friends, relatives, and even deluding themselves sometimes). All because they’re just way too scared to rock the boat, stand out or lose face? Or to be single again, because they forgot how to be independent or self-reliant? Financially and mentally independent and proud of it … way to go modern woman. Familyhood MAY work for Moses and Aimee … but it’s NOT everyone’s cup of tea. Why don’t they ask instead if every female enjoys popping out babies every 9 mths? Her life and career seems better than Moses and Aimees’! Business success and money is way better than having to deal with a screaming baby/babies. She’s a smart one! She made a great choice. She can do much better than Moses! I would always prefer Bernice Liu over Yang Mi or Aimee Chan. Very happy that she’s doing well. She’s beautiful, smart, and talented. Seriously, why in the world did Moses break up with Bernice?? She’s waaaaaaaaaaay better than his current wife, who is less elegant then her and less presentable then Bernice… man, talking about a major loss!